Pretzels have been around for almost 1,400 years. History has their origin about A.D. 610 when a baker in a monastery in southern France or northern Italy twisted leftover strips of bread dough into the shape of a person’s arms crossed in prayer, traditional posture for prayer in those days. Monks began offering the warm, doughy treats to children who had memorized their Bible verses and prayers. 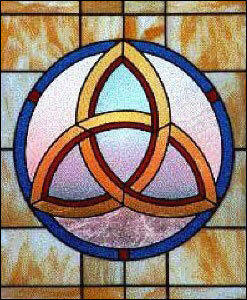 They were used to help children understand the Christian Trinity of Father, Son and Holy Ghost. The three empty holes in the pretzel represented the Christian Trinity. The monks called these treats pretiolas, Latin for little rewards. The little knotted treat wandered around a while and became known in old high German as Brachiatellium, and then just plain Bretzel or Pretzel. 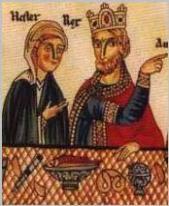 Left: one of the oldest depictions of pretzels in the Hortus Deliciarum of 1190 showing Queen Esther and King Ahasuerus sharing a meal. The king is pointing at the ale cans and dart board not shown in the detail. Medieval people would ride out and greet vendors traveling to the various fairs and offer them pewter pitchers of wine and crisp dough impaled on spears called Geleit-pretzels. 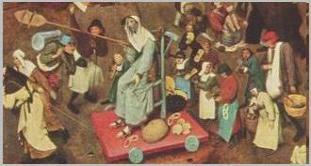 In the detail of the painting by Peter Bruegel titled “The Fight between Carnival and Lent”, 1559, the lusted-after pretzels are visible at the feet of the guy sitting on the dunk tank chair. Kepler stated that if we assume that the Earth is the center of the universe, we must accept that the planets travel in a loopy path “with the appearance of Lenten bread.” In all Catholic countries, the bread culture became highly developed because of meatless holidays, and since pretzels didn’t have any ingredients that were taboo during the pre-Easter season such as eggs, milk, butter or lard, the pretzel became a popular Lenten food throughout the Middle Ages. Plus, the white Brezl was popular for its keeping qualities. It was thick, satisfying and transported easily. The East Prussian Salzburger settlers kept the originally Catholic Brezl, but added yeast and raisins and let it rise on a metal tin, eating it on the day before the highest holiday of the Evangelist church, Karfreitag. The success of the pretiola spread to monasteries throughout the French and Italian wine regions and crossed over the Alps to Austria and Germany, where it became known as the bretzel, or pretzel. The pretzel became an important symbol in church life. A page from a prayer book of Catherine of Cleves depicts St. Bartholomew surrounded by pretzels, which were thought to bring good fortune, prosperity and spiritual wholeness to those who ate them. Pretzels were a convenient way to give food to the poor and became typical alms for the hungry. Those who gave pretzels away were considered particularly blessed. They became such a sacred symbol that they were often packed into coffins. A special recognition was given to the pretzel bakers in Austria. In 1510, the Ottoman Turks invaded Vienna by tunneling under the city walls. Pretzel bakers, working through the night, heard the strange noises in the cellars, grabbed every available weapon and killed the Turks. The city was saved and the grateful emperor awarded the pretzel bakers an honorary coat of arms. It shows a lion holding a shield with a pretzel in the middle. The term “tying the knot” has special significance concerning the pretzel. It seems pretzels were introduced into the wedding ceremony. The couple wished upon and broke a pretzel like a wishbone, then ate it to signify their oneness. A 17th century woodcut copied from a stained glass window in a cathedral in Berne, Switzerland, shows the pretzel being used as the “marriage knot” between two royal families. The Easter egg hunt may very well be a descendant of the tradition the Germans had at Easter. Pretzels were hidden around the farms for the children to find. They were then served with two hard-boiled eggs on Good Friday. The pretzel symbolized everlasting life and the two eggs nestled in each large hole represented Easter’s rebirth. At the beginning of the new year, German children tied pretzels on strings around their necks for prosperity, health and good fortune.